Alright, my lovelies, I’m hankering for summer. Here in Texas, we’re doing that warm-cold-warm-chilly-warm-wet dance that we do every year. I’m. Ready. For. Summer. This is the WORST part of the year. Like can’t we just decide if we want it to be cold or hot? Wet or dry? Come on, Texas! LOL! In preparation for my FAVORITE part of the year, I’ve already started working-out my drink-makin’-muscles. 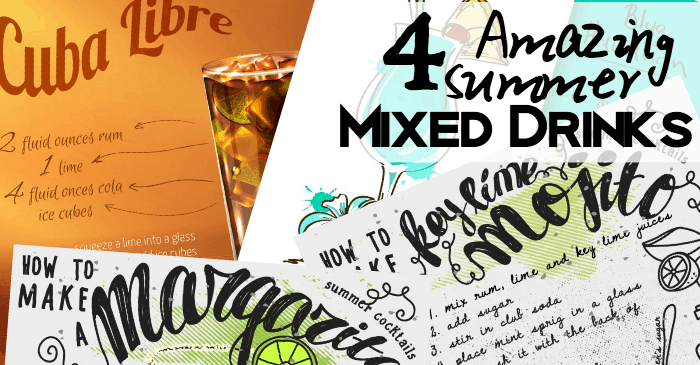 Here’s my tried-and-true 4 Amazing Summer Mixed Drinks that I like to make–although I urge you to drink responsibly. Just FYI. No irresponsible-ness here or there. Ya hear me? Heh.